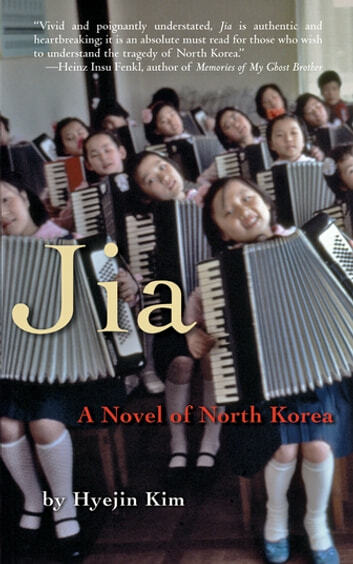 The first novel about present-day North Korea to be published in the West. A moving and true-to-life tale of courage in the face of oppression and exile. Hyejin Kim’s Jia follows the adventures of an orphaned young woman, Jia, who has the grace of a dancer but the misfortune of coming from a politically suspect family. In the isolated mining village of her childhood, Jia’s father, a science teacher, questions government intrusion into his classroom and is taken away by police, never to be heard from again. Now Jia must leave the village where her family has been sent as punishment to carve a path for herself. Her journey takes her first to Pyongyang, and finally to Shenyang in northeast China. Along the way, she falls in love with a soldier, befriends beggars, is kidnapped, beaten, and sold, negotiates Chinese culture, and learns to balance cruel necessity with the possibilities of kindness and love. Above all, Jia must remain wary, always ready to adapt to the “capricious political winds” of modern North Korea and China.